Home Box Office subscriber figures, Turner's fight against cord-cutting, and potential activist involvement could drive investor reaction. Media giant Time Warner (NYSE:TWX.DL) will report its fourth-quarter earnings on Wednesday, Feb. 10. The owner of HBO, Turner Networks, and Warner Bros. is expected to earn an adjusted $1.00 per share on revenue of around $7.53 billion -- both figures would be roughly flat from the same period last year. Over the last 12 months, shares of Time Warner have underperformed the broader S&P 500. 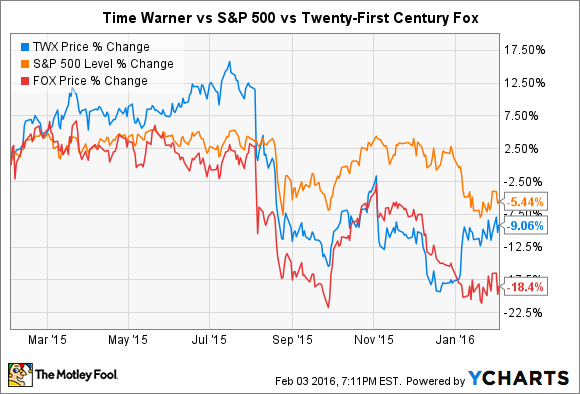 To its credit, media stocks in general have had a tough time -- Time Warner has outperformed rival Twenty-First Century Fox (NASDAQ:FOX), for example. Still, there's increasing speculation about Time Warner's future. Time Warner's results should provide an interesting glimpse into the state of the company's business. Here are three things Time Warner investors should pay close attention to when the company turns in its earnings report. Time Warner's Home Box Office business includes its premium, subscription-based networks, HBO and Cinemax. Each year in its annual report, Time Warner discloses the total number of subscribers these networks have collectively. Aided by international expansion, the figure has been climbing steadily over the last five years (from 81 million at the end of 2010 to 138 million at the end of 2014 -- a gain of more than 70%), but domestic growth has been sluggish (from 39.4 million at the end of 2010 to 46 million at the end of 2014 -- a gain of less than 17%). Last year, Time Warner took a rather unprecedented step, launching HBO as a digital, stand-alone offering. While HBO and its digital counterpart, HBO Go, still require a cable subscription, HBO Now is available to anyone in the U.S., regardless of whether they subscribe to cable. If Home Box Office's domestic subscriber base grew significantly in 2015, it would be evidence that this new digital strategy is working. Time Warner's other TV segment -- Turner -- remains firmly wedded to the traditional cable bundle. Last quarter, it generated about one-third of Time Warner's total revenue and more than half of its operating income. Turner owns a collection of the most popular cable channels, including TBS, TNT, CNN, and Cartoon Network. Last November, Time Warner shares plunged after the company turned in its third-quarter earnings report. Management admitted that, since the end of 2014, U.S. subscribers to Turner's networks had declined more than anticipated, fueling the long-running narrative that cord-cutting was a growing trend. During Time Warner's subsequent earnings call, management outlined a number of strategies it planned to use to limit the effects of cord-cutting and make its Turner networks more attractive to subscribers. These included reducing the number of ads it broadcasts on specific channels, slowly transitioning some of its programming to favor a younger demographic, and rethinking how it approached the licensing of its content to streaming video providers. Investors should look for the company to provide color on the success of these initiatives, and how it views the state of the paid-TV industry. Finally, there's been growing speculation that Time Warner's management would soon be challenged by an activist investor. Last month, The New York Post reported that Corvex Management was planning to target the company; more recent reports allege that famed activist investor Nelson Peltz is considering making a play. For now, these remain mere rumors, but Time Warner's management may not be taking them lightly. Late last month it passed a resolution that would allow any shareholder (or group of shareholders) that's held at least a 3% stake in the company for more than three years to nominate a new board member. By itself, the change won't make it more difficult for an activist to seize control of the company -- on the contrary, it's actually more investor-friendly -- but it may make it more difficult for an activist to argue that the existing board is out of touch. If an activist did get involved in Time Warner, possible demands could include spinning off HBO or selling the entire company outright. In the summer of 2014, Twenty-First Century Fox bid for Time Warner, offering a combination of cash and stock that would've valued the company at around $80 billion. After Time Warner's board refused, Fox pulled its bid, and has made no subsequent public attempts to purchase the company. It's hard to say what would've happened to the value of the stock Time Warner shareholders might've received, but with a market cap of nearly $57 billion, Time Warner is trading at a hefty discount relative to that valuation. On the company's last earnings call, management was asked explicitly about a potential Time Warner breakup. CEO Jeff Bewkes rejected it outright, arguing that Time Warner was well-positioned to succeed in its current state. With the recent rumblings, investors should look for the topic to be discussed once more.